The MET Gateway is a winner at the Galway Chamber Business Awards 2018! The annual Galway Chamber Business Awards 2018 took place on 1st December in the Galway Bay Hotel. 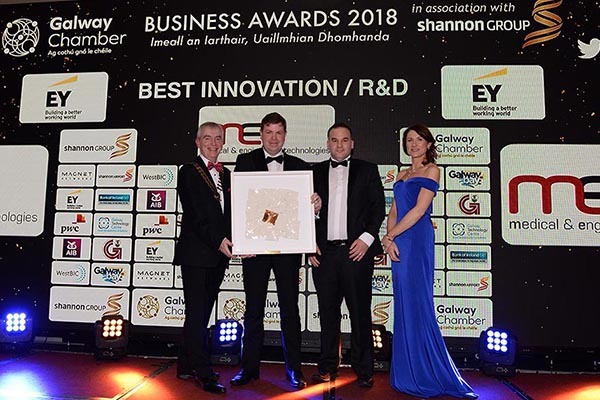 The awards are a celebration of the success of the Galway business community and were attended by a wide selection of Galway’s business and industry leaders, innovators and entrepreneurs. On the night, GMIT’s Enterprise Ireland MET Technology Gateway received the Galway Chamber of Commerce award for Best Innovation/R&D. This award was in recognition of MET’s innovative technologies and the supports it provides to MedTech companies for the design and assessment of their products. The Medical and Engineering Technologies (MET) Centre is an Enterprise Ireland-funded Technology Gateway providing world-class solutions for the MedTech and general manufacturing sectors. Based at GMIT’s Galway campus, the centre develops novel technologies relevant to both clinical research and MedTech companies operating in the design application phase. By actively engaging with clinical and industry partners, the MET Centre produces both scientific knowledge and technology outputs across a range of streams. Find out more about MET Technology Gateway or follow them on Twitter.